If you know me, by now you should know that I'm a big basketball buff. Thursdays are the days that this court gets the most numbers but Fridays are supposed to be our celebrity appearance day with not so many guys present at the Central courts at the ICGC church in Abossey Okine. Yesterday we were disappointed. The celebs didn't show up!. Ohhhh! Lil Shaker, Rumor and their Accra High ballers crew, thank you for not coming and you MutomboDaPoet too(I know say you no sheda wey you brown we...lol). But like the old folks always said; everything happens for a reason. What was nearly turning out to be a boring 2 on 2 day quickly evolved into one fine 3 on 3 NYC kinda ball game. 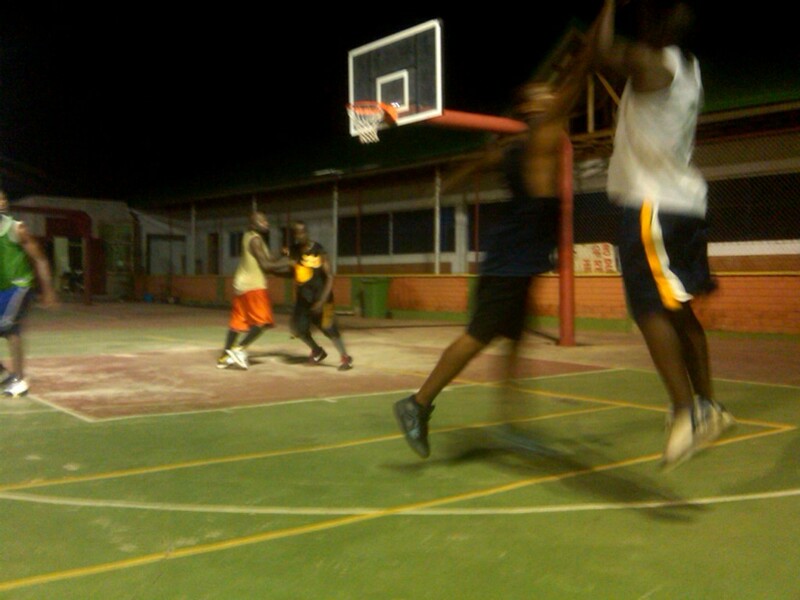 I saw yesterday as the birth if not the rebirth of pick up basketball proper on the soil of that facility. I bet you, you wouldn't wanna miss a Friday again on that court if you know what basketball is all about; love, toughness, team work and fun. I've played a lot memorable games in my life but yesterday was a day me and all the other ballers present on that court will not easily forget about. Stories of it will be told in years to come. We played pick up how it was supposed to be played. I could be wrong but per the definitions, trailers and stories we've heard from my big brother baller pal Bobbito Garcia and his Doin' It In The Park, NYC documentary crew I know I'm right. The rules were simple; PLAY HARD OR SHUT AND GO HOME, NO BLOOD NO FOUL, FOULS ONLY CALLED IF IT HAD A DIRECT NEGATIVE IMPACT ON THE FLOW OF THE GAME OR A PLAYER'S WELL BEING. I pray and wish this culture spreads to all other courts in our city with time. shouts outs to all the guys that go out hard everyday and play their hearts out from courts way up in Tamale right down to the courts by the sea in Cape Coast; my Accra city blues crew, my team fufu family, my Gbawe flight brothers, Ksi social club/ Tech/ Evandy crews...the list can go on all day. Y'all just keep playing ball, for this game is for people who really give a damn about it! Good job. Will try and make it next time.